Summer time is quickly approaching, but what does that have to do with the care for your jewelry? There are many chemicals that can damage your precious jewelry without you being aware of it. The damage can be devastating and even un-repairable. It's very important to take proper care of your treasured pieces and know what factors may harm them. Who doesn't love a dip in the pool or a relaxing evening in the hot tub? You may love it, but your jewelry is screaming, "Help me!" Chlorine causes what is called stress corrosion cracking. Gold can actually disintegrate when being exposed to even a small amount. If your Gold is disintegrating, that means your Diamonds and Gemstones are likely to fall out. Don't forget that chlorine is also found in cleaning solutions such as bleach. So make sure to remove any jewelry before using harsh chemicals. A day at the beach may not be just a day at the beach if your jewelry encounters Saltwater. Saltwater is another substance that is considered corrosive. 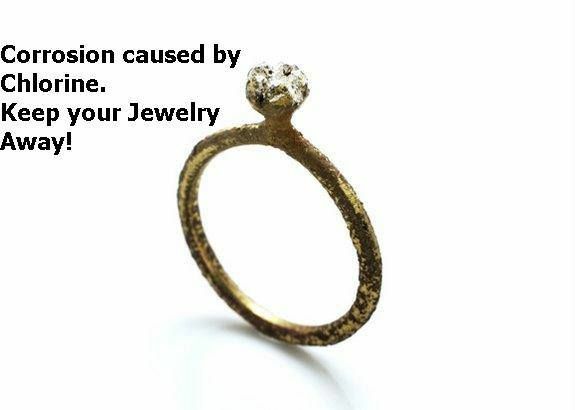 Just like erosion happens to the earth, it will happen to your jewelry. If sea weather gets into joints that were soldered, it will start to wear down the metal. Once the metal is gone, so is your Diamond, Gemstones, and your precious piece. We strongly recommend that you remove any precious jewelry before entering any toxic environment. Also, please have your jewelry professionally checked and cleaned at least once every 6 months. The more often the better. 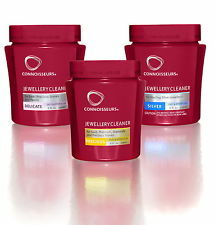 A good way to keep your jewelry looking new between visits is to use a jewelry cleaner that you can purchase right at our store.